4 large zucchini, sliced lengthwise and middle scooped out and reserved. Brown beef, peppers, onions and the middle part of the zucchini that was scooped out. Leave “boats” on a sprayed sheet pan. Add taco seasoning and water. Stir and simmer a few minutes until seasoning is equally distributed. In a large bowl, add beef, cheddar, mascarpone, parsley. Mix well. 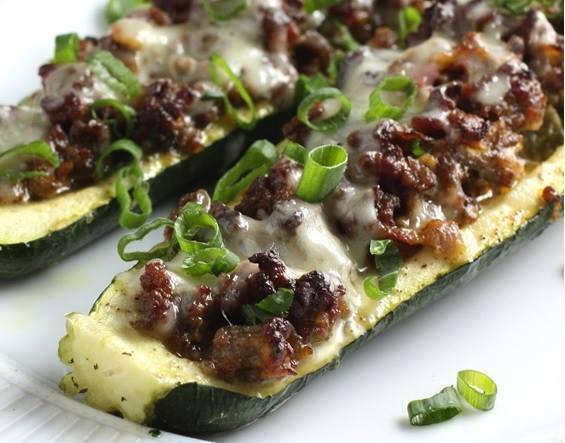 Spoon mixture into each zucchini boat. Bake 400* for 30 minutes. If zucchini is not done, return to oven and check after 10 more minutes. Remove, sprinkle mozzarella cheese and return to oven. Turn heat off. Cheese will melt in 3-5 minutes. Top with green onions and serve.